(a) Disconnect the skid control sensor connector. (b) Remove the bolt and disconnect the bracket from the rear axle beam assembly. (a) Remove the bolt and speed sensor rear LH. 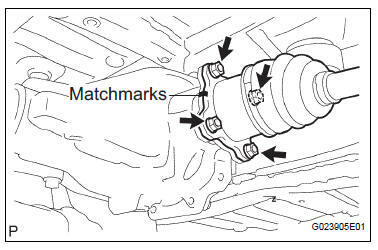 (a) Place matchmarks on the rear drive shaft assembly LH and differential flange. (b) Remove the 4 nuts and 4 washers, separate rear drive shaft assembly LH. (a) Remove the 2 bolts and parking brake cable assembly No.3. 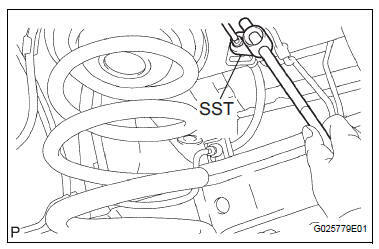 (a) Using SST, separate the brake tube from the flexible hose. Catch the brake fluid with a container as it drains out. (b) Remove the clip, and separate the flexible hose. (c) Remove the bolt and separate the brake tube from rear axle beam assembly. (a) Remove the 2 bolts, 3 screws, 3 nuts and fuel tank filler pipe protector. (b) Remove the 3 bolts and fuel tank filler hose cover. (a) Remove the 2 bolts and floor No.2 crossmember brace. (a) Refer to hint below. HINT: Loosen the RH side by the same procedures as the LH side. When loosening the bolt, hold the nut not to rotate. Do not remove the bolt and nut. (a) Support the rear axle beam assembly with a jack. (b) Remove the bolt and separate the shock absorber assembly rear LH. (a) Apply a shop rug between the coil spring rear LH and rear axle beam assembly. (b) Apply a shop rug between the coil spring rear RH and rear axle beam assembly. (c) Remove the coil spring LH by slowly lowering the jack. (a) Remove the rear coil spring insulator upper LH from the coil spring rear LH.